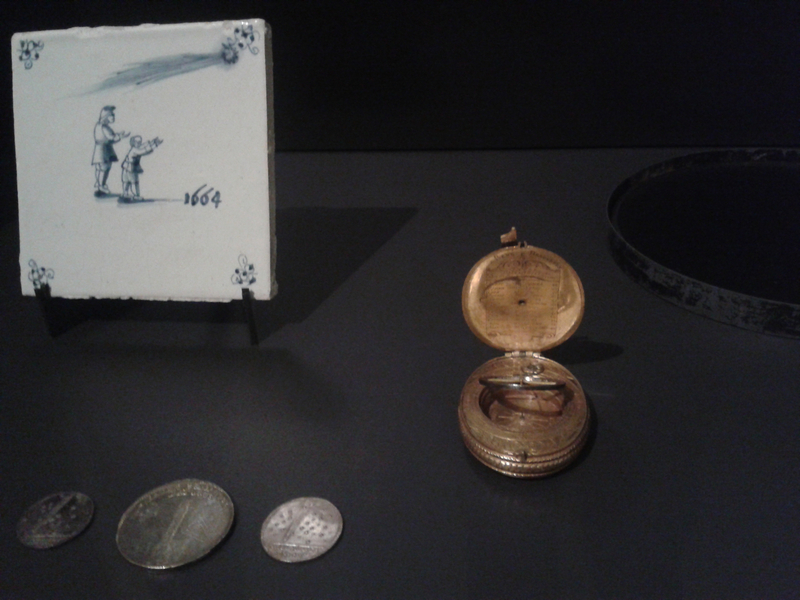 Descartes’ nocturlabe – a nocturnal watch – is on display at the Rijks Museum, Amsterdam. It is an exquisite object, beautifully engraved, and small enough to fit into the palm of your hand. The nocturlabe contains a sundial and a compass. 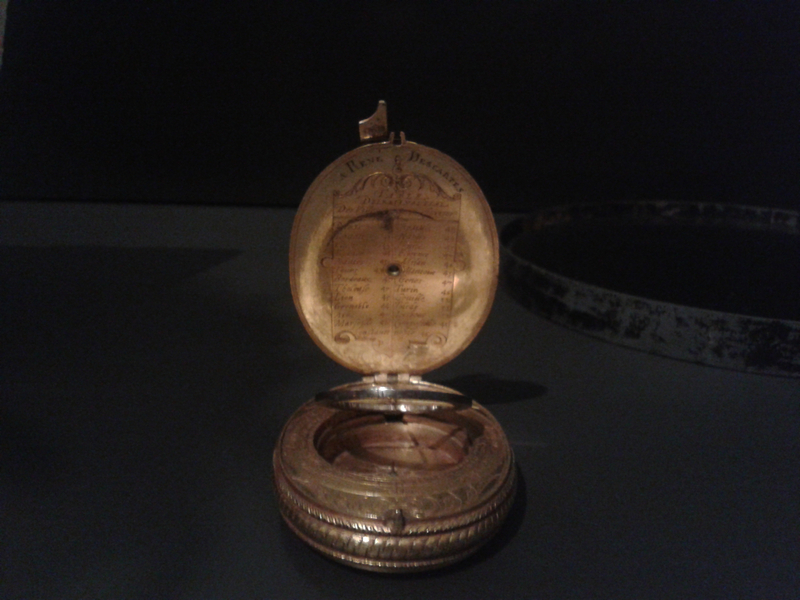 Inside the lid, and just visible, a list of cities (many of them French) and their longitude. This was a way to tell the time, and could be used at night as well as during the day. Crucially, it was portable, and could be attached by a chain to a buttonhole and slipped into a pocket. The nocturlabe was a gift, but it is not known who gave it to Descartes. Other than his correspondence, it is the only item thought to be his that survives. Time is experienced differently by the characters of my novel, The Words in my Hand. Descartes owned a clock, and a nocturnal watch. Mr Sergeant, an Amsterdam bookseller, with whom Descartes lodged, has a watch. Time is something they can pocket, and can measure. Time matters as much to Helena, a maid, but she experiences it, and describes it differently. It becomes visible in other ways – in the work she does, the journeys she makes; in the passing seasons and her daughter’s growing. Was time increasingly gendered? Yes, I think to some extent it was. Although Elizabeth I owned an astrolabe, few women owned similar even a century later. I flipped the catch to open it, and looked at the needle in the centre. I could not say what the time was, but already, even though the day was dull, the sun had moved on a little. I did not want to be reminded of that, of time passing, of her leaving. Because then she would be gone. ‘Here,’ I said, returning it to his hands. Dutch genre paintings are useful for seeing how quickly times (sorry) were changing. Christiaan Huygens builds the first pendulum clock in 1656. Jan Steen’s Beware of Luxury, 1663, shows a clock on the wall, and through the later seventeenth century, clock ownership becomes more prevalent. I don’t wear a watch, but that’s because I work on my laptop all day and can easily find out the time. I take knowing what the time is for granted. A nocturlabe was not an everyday object, it was expensive and required skill. And if I had neither watch, nor nocturlabe, I’d most likely be marking time in the way Helena did, in the work I do (this blog post, which has taken the best part of the morning to write), and in my daughter’s growing.